At the 2013 Parish Life Conference of the Dioceses of New York / Washington and Charleston / Oakland, Fr. Noah Bushelli gave a talk on Orthodox Christian parenting. The Rev. Fr. 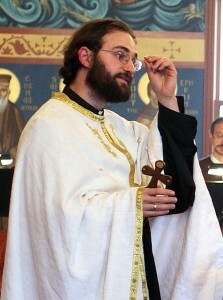 Noah Bushelli is pastor of St. Philip Orthodox Church in Souderton, Pennsylvania. He is also a homeschooling father of six children and has presented several retreats on both parenting in general as well as homeschooling, in addition to retreats designed for middle school age children. Click image to read about our 2013 PLC speakers! On July 3-7, 2013, St. Paul’s hosted the Dioceses of New York / Washington and Charleston / Oakland for the 2013 Parish Life Conference. As part of this conference, four spiritual talks were presented. All four of our speakers graciously agreed to allow us to record their talks, and Ancient Faith Radio kindly published them online for free downloading. Following are the speakers and their talks. Click on the titles to get to the audio. Dr. Christopher Veniamin is Professor of Patristics at St. Tikhon’s Orthodox Theological Seminary and a spiritual son of Elder Sophrony Sakharov, a spiritual giant of the 20th century. He earned his M.A. in Theology from the University of Thessalonica and went on to receive his D.Phil. from Oxford University, under the direction of Metropolitan Kallistos Ware. Description: How do we live as Christians? Or perhaps a better way of framing the question would be, How do we die every day as disciples of Christ in this broken world of ours? This presentation aims to give some practical advice on living the commandments of Christ, based on the theology of the Church Fathers, and in particular of St Gregory Palamas, St Silouan the Athonite and Elder Sophrony of Essex. Jonathan Jackson is a five-time Emmy Award winning actor and musician. Among many roles in both film and television, he has starred as “Lucky Spencer” in General Hospital (1993-1999, 2009-2011) as well as “Avery Barkley” on Nashville (2012-present), and he is the lead singer of the independent rock band Enation (2004-present). In 2012, Jonathan and his family were baptized into the Orthodox Church (read about and listen to an interview our pastor Fr. Andrew did with Jonathan on his conversion to Orthodoxy here). Jonathan played a “coffee house” concert for us as well as spoke about his journey into the Orthodox Church.